In the spirit of silly, commercialized martial arts acronyms, I have come up with my own: MESHworkTM (Multiply Entwined Skill Hierarchy). A mesh is a material composed of many linked rings, for example chainmail or a wool sweater. 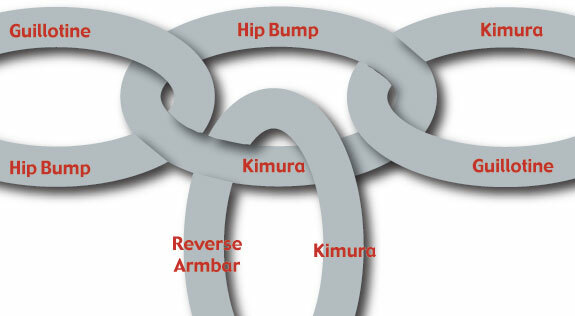 An effective combat "game", in both sport and self-defense, has to be composed of an interlinking network of techniques. Very few things come as ones, in order to effectively strike combinations of alternating appendages, targets, and levels are used. A jab sets up a cross, which sets up a hook, which sets up a cross, etc. To throw or takedown misdirection by another intended throw or takedown sets up the next one, pushing in one direction creates weakness in another. In BJJ the expression, "If one door closes, three windows open" describes attacking or positioning and "opening" submission attempts. On a more complicated level, hit some one if our want to submit or throw them, that is, combining skills from "different arts" But these movements have to be cohesive and goal oriented to create a chain, a net, a flow, or a meshwork of offensive and defensive skills. Although technical excellence of solitary combat skills is critical, I think weaving these skills together, although technically challenging make the practice of them dynamic, alive, and more applicable. In real life, whether in the squared circle or the concrete jungle, we don't do one static event, we string together a montage of many dynamic ones. Each one can be used directly to submit or sweep, but provokes a defensive response that creates an opening for the other two and can in turn branch off into other techniques. Note that sound, simple moves can be strung together to create complex combat "gameness". Fancy is not required, nor is rapidly switching moves, commit to one see where it goes and what it opens. On to the application in practice: light warm-up with shadow boxing, pummeling, ogoshi uchi komi, and circling for the shot (i.e. shuffling in a circle and shooting off this movement). Jab - Cross - Side cover (lead hook to head) with "praying mantis" hook at neck - lead knee - elevate cover elbow and duck under to thai "figure 4" clinch. Lead hand is at neck, rear hand has forward pressure on triceps. Alternatively (with no gloves or MMA gloves) figure 4 over arm just distal to shoulder. Keep kneeing. Sambo hip toss: keep neck control, reach over with other hand, step hips in and throw hip toss from "outside"
Reviewed the armbar-flower sweep flow. Noted the possibility of trying to open with a sweep to secure the strong armbar position. A second aside: As a coach and competitor in "different arts" I often see people who train like me describing themselves as an aspect of one of these "styles". If I train both striking and grappling, I'm well rounded not a striker who also rolls a little. The difference between one art and another is largely geometrical, in this example one usually occurs in a vertical plane (standing) and the other in a horizontal plane (lying on the floor). Many of the same attributes and concepts lend themselves to both "styles". Yes there are technical facets that are different and favor different attributes but looking past this at the deeper context of what you are doing lends itself to greater proficiency at not only the "style" you are currently practicing but the other ones you train. I've heard the quote "it's not martial arts, it's martial art" understanding the broad brushstrokes makes filling in the fine prose a lot easier.